Have you thanked your game master lately? Today (March 4) is International GM’s Day! 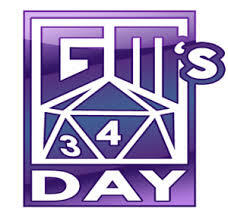 Since 2002 this day has been designated as a time to appreciate your local game master for all the hard work he or she put into giving you an enjoyable gaming experience. It is also, coincidentally, the anniversary of the death of E. Gary Gygax, the grandfather of all GMs and father of Dungeons & Dragons. This is especially special because this year is the fortieth anniversary of the release of D&D, the game that started it all. Game Masters put in an awful lot of hard work for their players. Long hours of plotting and mapping. Making props. Logging adventure notes. Rolling with the various curve-balls thrown at them by players. All for the enjoyment of everyone seated around that table. You can also celebrate “Read an RPG Book in Public” week. This celebration of gamer geekdom was created by The Escapist and is celebrated three times a year. Take out a rulebook and get a conversation started about our hobby! So show your appreciation to your poor, old, beleaguered GM. Give them an extra slice of pizza next time you game. Sharpen their pencils. Munchkin a little less next session. Or just say thanks for all the hard work. Usually, enjoying the game is thanks enough, but now’s a good time to show that appreciation with a little extra love.